Who here hasn't had a Margarita at a party, a beer while watching the ball game, a glass of wine with dinner? And haven't studies found moderate consumption of alcohol to be good for us? It's not that simple. Despite only being a regulated product (and not a "controlled substance" or illicit drug), alcohol consumption actually carries a risk of adverse health and social consequences, the World Health Organization says. Health ministers on Thursday signed a nonbinding resolution to try to curb binge drinking and other growing forms of excessive alcohol use through higher taxes on alcoholic drinks and tighter marketing regulations, specifically those aimed at young people. The nonbinding resolution only serves as guidance to WHO's 193 member states, as Reuters reported. Alcohol is a central nervous system depressant that affects every organ in the drinker's body and can impair brain function and motor skills. Heavy use can increase mental health problems and the risk of certain cancers, stroke and liver disease. Alcoholism results in harm to one's health, interpersonal relationships and ability to work. "Alcohol is usually not perceived as a killer, though it is," Shekhar Saxena, director of WHO's department of mental health and substance abuse, said in a news briefing, Reuters reported. Worldwide, alcohol causes 2.5 million deaths (3.8% of total) a year, of which about a third are due to accidents, the WHO says. The figure includes 320,000 young people between the ages of 15 and 29. Of course, with none of the policies binding and with the industry remaining largely self-regulated, the Global Alcohol Producers Group, to which Molson Coors (TAP), Anheuser-Busch Inbev (BUD), Diageo (DEO), Constellation Brands (STZ) and others belong, had a generally positive response to the resolution. It's interesting as yet another report from Tuesday by The Center for Digital Democracy and Berkeley Media Studies Group of the Public Health Institute showed how "alcohol companies are using the latest new media technologies to promote their products using methods that appeal to youth." They harvest behavioral and other data on consumers, which causes concerns about the effect it may have on underage drinking, the report notes. The Center on Alcohol Marketing and Youth estimates underage drinking to account for 12%-20% of the U.S. alcohol market -- perhaps too big a cut for marketers of a self-regulated industry to ignore. It's not just those insidious beer commercials anymore. It's a virtual-world housing and entertainment complex created by Heineken, YouTube videos by Smirnoff, Absolut, Budweiser and others, a free iPhone game from Malibu rum, the use of Facebook, MySpace and other social media sites to track, analyze and better target consumers, and so on. The report was sent to the Federal Trade Commission, urging the regulatory body to assess the adequacy of age-verification mechanisms and the alcohol industry to strengthen its self-regulatory codes. Indeed, the WHO didn't ignore these tactics and said in its report that alcohol is being "marketed through increasingly sophisticated advertising and promotion techniques," including sponsoring sport events, organizations, teams and concerts and through e-mails, texts, podcasting and social media to reach consumers, some of them underage. But Alcohol in Moderation is Healthy, Right? Even moderate underage drinking isn't a good idea. Studies have shown that alcohol use by youth and young adults increases the risk of both fatal and nonfatal injuries, the CDC writes. Also, youth who use alcohol before age 15 are five times more likely to become alcohol dependent than adults who begin drinking at age 21. And yes, many studies have shown high association between low-to-moderate alcohol consumption and different health benefits. 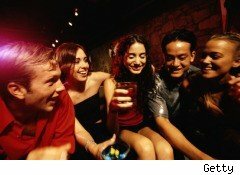 But a new study questions whether alcohol is the reason. It's just as likely, researchers say, that moderate alcohol intake is an indicator of higher social level, better general health and lower cardiovascular risk. Association is not necessarily causation. In the U.S., 51.6% of Americans age 12 and older had used alcohol at least once in the 30 days prior to being surveyed in 2008; 23.3% had binged (5+ drinks within 2 hours); and 23.3% drank heavily (5+ drinks on 5+ occasions). In the 12-17 age range, 14.6% had consumed at least one drink in the 30 days prior to being surveyed.